With various robotic aircraft (UAV's, UAS, drones) becoming available to farmers and agronomists, it is important to carefully weigh the available options. Just as farmers have more than one tractor on the farm where each one is better suited for specific applications, robotic aircraft come in various configurations and sizes. For example, you wouldn't think of using your large John Deere 9R 560 engine hp, 20,000-pound hitch-lift capacity on a small test plot. Nor would you use your garden tractor to work a section of ground. Each machine is better suited for certain applications. Robotic aircraft for farm use are available in five different configurations. Each one is better suited for its designed application. There are multi-copters, helicopters, fixed-wing modified hobby model airplanes, fixed-wing exotic military grade and fixed-wing systems that are designed specifically for agricultural use. While many of the systems on the market today claim that they work well for agriculture, very few were actually designed for the farmer/agronomist in mind. Many are modified hobby systems. Another element to consider is your time. If you love to tinker and prefer to tinker over farm or managing your farm - there are kits and systems that can absorb any all of your time. For example, when personal computers were being developed in the early 1980's, hobbyist and engineers garages and basements were the hot bed for people who loved to tinker with technology. But today, very few people who simply want to get a spreadsheet to work would think of building their own computer. Robotic aircraft are the same way. Yes, just a few years ago a lot of experimentation was going on with robotic aircraft but today, farmers who simply want to get an aerial image of the crops done simply, safely and quickly are not interested in wasting a ton of time and money experimenting. Systems that allow you to tinker are available in all of the above categories. The system must identify areas of the crops where yields can be increased and/or input costs reduced. Simple & Easy: The system must not be complicated to operate. Most farmers are not interested in flying robotic aircraft for fun and they don't want to tinker with it. They want a system that will do its job with out a lot of training or experience. Reliable and robust: The system must be reliable and consistent in its performance. It must me tough enough to withstand daily, rigorous use with the survivability of holding up to bumps, bangs and mishaps. Cost effective: Farmers told us, cost is an important aspect. The best thing about a multicopters and helicopters is their ability to hover. They especially handy if you have a small area to cover that won't take long to photograph from the air. For example if you simply have a few small test plots that you want to photograph and you don't have large acres (1,000 hectares or less) multicopters are great. The fact that they hover is especially handy if you are flying in a very congested area like a forest or an orchard where landing is tricky. Vertical takeoffs and landing is good when you are between fruit trees or vineyards. 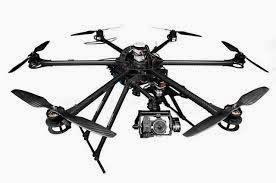 However if your interest is in surveying large acreage of 500 acres or more, multicopters are not the best system because of their relatively short flight time duration. Because multicopters sustain flight by motors and propellers pointing straight up, they use a lot of energy to fly. Also, most multicopters are slow in covering a lot of ground. When you combine the fact that their ground speed is slow compared to a fixed wing system plus the fact they use a lot of energy just to stay aloft add up to a short flight time, thus few acres covered. Another element to consider is the challenges multicopters have with wind. Aerial images captured early in the season for example with corn, allows the farmer to take corrective action in this narrow window of time. For this reason you don't want a system that grounds you because of wind. If you live in an area where it is often windy, a multicopter is probably not the best platform for you. Lastly, most multicopters are delicate. One bump into a corn stalk or being bumped around in the back of a pickup can ground a multicopter. 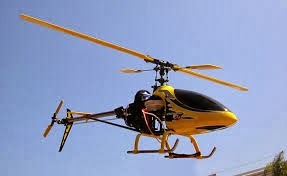 A purpose built ag copter should be the only consideration. There are many cheap toy copters on the market, but for a serious farm tool, only look at those built the handle ag. In summary, multicopters are great for small acreage in light wind conditions. We don't see many small helicopters for agriculture yet because of their complexity, cost and the required regular maintenance. Like a multicopter the biggest benefit is the ability to hover and takeoff and land vertically. However, different than a multicopter gasoline powered helicopters have the ability stay aloft longer and can lift much more weight. The downside of helicopters is cost. Most systems can go as high as $80,000 or more. Also complexity of maintenance and durability are also concerns with helicopters. There are some decent modified hobby type model airplanes on the market. Most are foam and are very lightweight. Like the multicopter though, most are unable to fly in winds over 10 mph or so. The positive of some of these systems is that they can be hand tossed into the air. However, most systems that can be hand tossed into the air do not fly well in the wind. Another huge challenge with hobby type airframes is the fact that they are not as durable as systems that are designed to be flown several times a day like airframes that AgEagle uses. Some hobby type systems go as far as to suggest that their airframes are only designed to last 30-40 times. This can get expensive and time consuming for farmers and agronomists. If you like to tinker, don't have a need to fly when it is windy, have time to kill and don't mind replacing airframes periodically, hobby wings may work. However if you do need to fly during windy conditions and just want to get aerial images of crops - there are systems designed for agricultural use that are much better. While systems that feature military grade airframes, autopilots and controls are very good systems they are generally more than a medium sized farmer needs. Many manufactures tout their airframes as being made as the same process used to manufacture drones for the military. Some of these manufactures promote the fact that the autopilot they use is manufactured to military specs which also means they require you to purchase custom controllers and computers to interface with their autopilot. 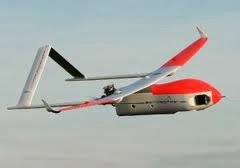 Of course, if you are a large station owner, seeking to monitor stock, pastural land over large areas, power lines, forest reserves, etc, these type of high endurance, long range UAVs will be the most suitable. Military grade equipment is built to very high standards, but these systems are more costly and complex for the average farmer. Contact us to find the best size UAV for your needs. Actually there are very few robotic aerial imaging systems designed specifically for agriculture that are commercially available. If you look at most manufactures web sites they cover everything from surveying land, fire and rescue to tracking endangered animals. However, most of these manufactures have a tab to agriculture. Will these systems work for agriculture? Probably yes, under ideal conditions and for limited durability. There are several peculiarities with agricultural use of robotic aircraft. Manufactures who are not experienced in agriculture or understand the needs of agricultural use are simply patching a system together to make it work on the farm. Some of the peculiarities of designing systems for agriculture are subtle but in the end can make a huge impact if the manufacture does not carefully address each one. For example, one of the elements that is often overlooked is the fact that robotic aircraft can make their biggest impact early in the spring when coincidently the wind is blowing the hardest. Hobby type model airplanes just cannot handle windy conditions. In fact, some systems do not even monitor airspeed with their autopilot, just ground speed via the GPS. This may not sound like a big deal, but having the ability for the autopilot to know how fast the wind is blowing makes the difference whether you can fly or not. Most any system that can be hand tossed into the air can probably not fly in much wind. 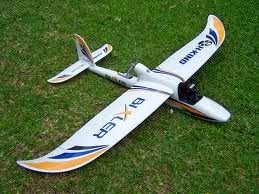 The airfoil is simply designed for slow flight, thus does not handle windy conditions well. For these reasons AgEagle has developed a catapult launcher that allows one person to launch the AgEagle regardless of the wind conditions. The "Long-Bow" catapult launcher comes with the AgEagle system that makes every launch successful. Another determining differentiator of a system that is designed specifically for agriculture and handling windy conditions is how the computer creates the flight plan. If it is simply a lawnmower type pattern, this is not a good pattern for flying in windy conditions. Instead, systems for agricultural aerial imaging create a modified pattern commonly referred as a interleaving or "skip path" pattern. The AgEagle uses this type of advanced scan pattern which reduces the bank during the turns thus reducing the effects of windy conditions. Interleaving patterns also creates higher quality aerial images because the photographs are taken at two different time intervals. Although most farmers and agronomists don't care if the aerial images are taken with a camera strapped to a pigeon, kite or robotic aircraft. They just want the good aerial images that will help them increase crop yields. But they do want the aircraft to be strong and robust for daily use. For these reason the AgEagle is a flying wing design without a tail. 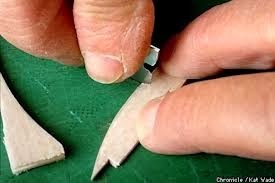 The benefit of not having a tail is there are fewer parts to break or fail, thus making the wing more durable. Also, Kevlar protects the leading edge from bumps and abrasion while carbon fiber strategically reinforces the wing. The resulting AgEagle wing can take the daily bumps and bruises that a farmer can dish out. Lastly, systems that are specifically designed for agriculture are complete systems, not an "assemble it yourself system. " 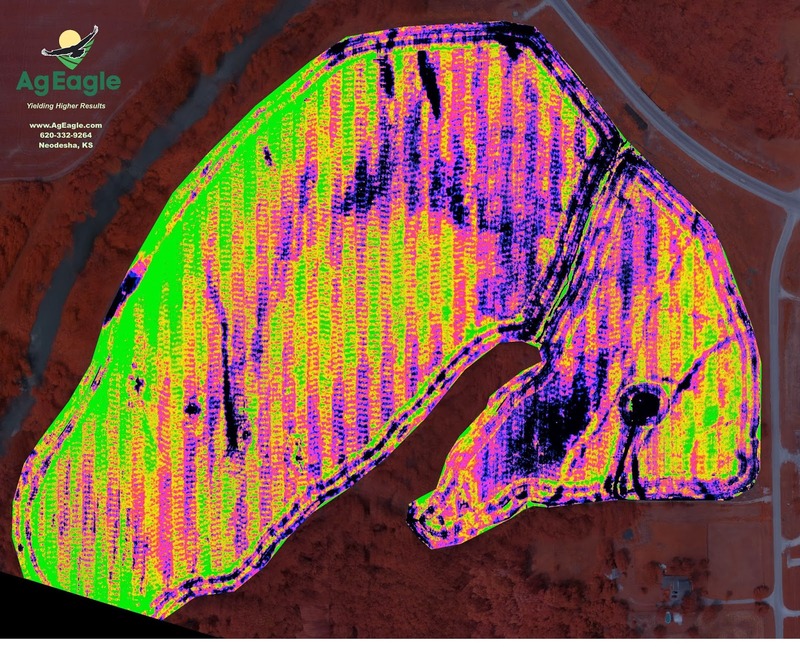 The AgEagle system included everything an agronomist or farmer needs including aircraft, launcher, NDVI camera, software to control the aircraft, stitch the aerial images together and also software that enhances the resulting aerial image. 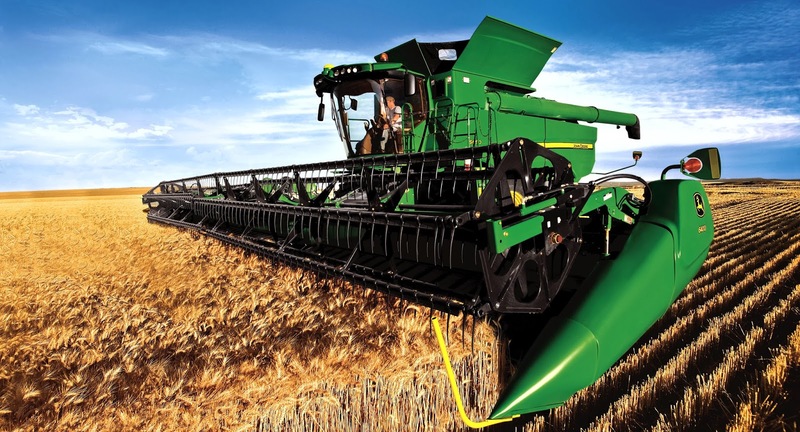 In addition, quality agricultural systems educate their customers on all aspects of using and operating their system. If a manufacture simply promises to ship you a system without helping learn how to operate it, look for a reputable company who takes time to help their customers learn how to operate the aircraft and the associated software.